Pretty amethyst server would be nice for mints or special treats. Pretty dark amethyst coloring. 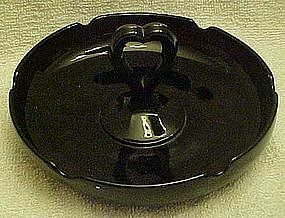 Measures 6 1/8" wide and has a center heart handle. 1 1/4" deep. Perfect condition with no scratches or damages. I believe this is made by Imperial Glass.